We are beginning to experience the unwelcome consequences of attempting limitless growth on a relentlessly finite planet. We must leave behind the technofantasy that we live on a world without limits. We need to make an urgent transition to a new pattern of living, one based on simplicity, frugality and agrarian restoration. This transition will be both mentally and behaviorally difficult. More than any other skills, we will need mental clearheadedness, clarity of purpose, patience and perseverance. These skills all, in turn, draw upon a mental quality called vitality. If managed well, mental vitality will enable our rapid yet civil transition to sustainable living. Discussed here is an assessment tool for measuring and managing mental vitality. Responding to climate disruption, resource limits and energy descent will require dramatic behavior change on a massive scale. The changes we make will need to stick, over a long period of time, since there will be no "getting back to normal." We are, in short, confronting a new normal. One implication of this new bio-physical reality is the need for each one of us to become behavioral entrepreneurs. In order to respond well to the coming downshift, the behavioral entrepreneur will need to craft or adopt a great many new, and newly re-learned, skills. But none will be more central than the ability to to plan and manage behavior, and to cope with the emotions resulting from losing either an affluent lifestyle or the hope that perpetual growth will one day offer us such a lifestyle. The skills and abilities needed to respond well to this emerging challenge, all require a mental state called vitality. Unfortunately, this mental resource seems to be in short supply these days. Since burned out people cannot help heal the planet, restoring and managing mental vitality become preconditions for our civil transition to durable living. The Localization Papers, and the related book The Localization Reader, discuss a framework for this transition. See here for an EcoShock Radio interview on mental vitality and localization (Energy Bulletin, 2012). This transition, urgent as it may be, will be difficult. The Workshop on Urgent Transitions, a research effort at the University of Michigan, is tasked with: (a) helping people to cope with what may be dramatic, and at times unnerving, behavior change, (b) helping people to plan for, motivate and maintain behavioral resilience and (c) helping communities to pre-familiarize themselves with living well within the limits of local ecosystems. One goal of this research is to help people restore and maintain mental vitality so that they can get on with the task of healing the planet and living in a durable manner. The measures of mental vitality, of which the Stroop test discussed below is one, are a part of this research effort. To understand the mental process involved in the Stroop effect, look at the following four letters: tree. If you are like most people it is difficult for you not to quickly read the word "tree." Most humans are so proficient at reading, at perceiving whole words, that they do not easily notice the individual letters. This is why proofreading is so hard to do. This tendency to quickly perceive words is used in testing for the Stroop effect. The Stroop effect (sometimes called the Stroop test) is an outcome of our mental (attentional) vitality and flexibility. The effect is related to the ability of most people to read words more quickly and automatically than they can name colors. If a word is displayed in a color different from the color it actually names; for example, if the word green is written in blue ink (as shown in the figure to the left) then we have a hard time noticing the blue ink. In this instance, even when asked to name the color of the ink, we tend to say the name the word represents. John Ridley Stroop first reported this effect in his Ph.D. dissertation published in 1935. Current research on the Stroop effect emphasizes the interference that automatic processing of words has on the more mentally effortful task of just naming the ink color. The task of making an appropriate response - when given two conflicting signals - has tentatively been located in a part of the brain called the anterior cingulate. This is a region that lies between the right and left halves of the frontal portion of the brain. It is involved in a wide range of cognitive processes. Although the functions of the anterior cingulate are very complex, broadly speaking it acts as a conduit between lower, somewhat more impulse-driven brain regions and higher, somewhat more thought-driven behaviors. The Stroop effect's sensitivity to changes in brain function may be related to its association with the anterior cingulate. The cognitive mechanism at work in this process is called directed attention. This mental resource is used to manage our thoughts by inhibiting one response in order to say or do something else. The capacity to direct attention is a foundational mental resource that allows us to voluntarily manage the focus of our thoughts. It is useful in our effort to remain effective, productive, clearheaded and helpful. We can use it to inhibit the power of certain features of the immediate physical and social environment, as well as internal distractions, so as to allow consideration of less salient but nonetheless valued information. Directed attention allows for a variety of prosocial and proenvironmental behaviors. It permits us to pursue important goals despite interesting competition in the immediate setting, to help others despite our own unmet needs, and to resist temptation so that we can remain devoted to a larger concern. In short, the capacity to direct attention is an essential resource for achieving both civility and environmental stewardship. Research indicates that directed attention is a scarce and finite mental resource. When placed under continual demand, our ability to direct the focus of our thoughts tires, resulting in a condition called directed attention fatigue (DAF). This condition reduces our overall mental effectiveness and makes consideration of abstract concepts and long-term goals difficult, at best. DAF causes irritability and impulsivity that results in thoughtless and regrettable behavior, impatience that has us making poor decisions, and distractibility that allows the immediate environment to have a greatly magnified effect on our decisions. By dramatically reducing the ability to plan and monitor our behavior, directed attention fatigue makes both pro-environmental and pro-social behavior much less likely. There are several ways to demonstrate the Stroop effect. When included in a properly designed experiment, they can also be used to measure our capacity to direct attention. These methods share the same basic procedure. 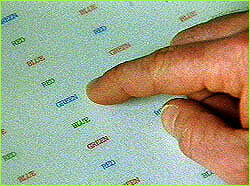 A paper version of the Stroop task involves showing words that are the names of colors in the participant's native language (for an English language version see Stroop test image here and other images here and here). The letters making up each word are printed in a color of ink different from the color name the word represents. You are asked to quickly respond with the color ink you see, and inhibit the printed word. It turns out that this is much harder than it sounds and research documents lower scores with increased directed attention fatigue. As part of a study of the effect of high altitudes on mountain climbers, NOVA created an interactive web-based test of the Stroop effect involving three stages (see Table 1) . This version is available below. The third stage of the online test demonstrates the Stroop effect with color words displayed in the wrong color. Each stage is preceded by three (3) short practice demos. Once a given stage starts you will be asked to use the keyboard left and right arrow keys to give your responses. At the end of each stage the task will display your score (number correct and time). Stage 1 - Quickly choose the word that matches the color within the rectangle on top. Stage 2 - Quickly choose the word that matches the word on top. displayed, rather than the color that the word names. Most people will find Stage 3 harder to do. You may find yourself taking more time for each word and may frequently make the mistake of giving the wrong keyboard response. The more your capacity to direct attention is fatigued, the harder this stage becomes. Try it when you are well rested. Then compare your performance after staying up very late working on a difficult and complicated task. Click the blue button below to take the online Stroop test. If your web browser does not have the Shockwave plug-in necessary to run this demonstration, you can install it from the Adobe website. Portions used with permission. The ShockWave version of the Stroop test was developed for Nova with assistance from Rick Mahurin of the Battelle Seattle Research Center. Site is hosted and maintained by the Workshop on Urgent Transitions, Environmental Psychology Lab, School of Natural Resources and Environment, University of Michigan, Ann Arbor, MI 48109. Documents maintained on the ResearchGate system and the University of Michigan's Deep Blue archive. Emerging biophysical limits, and the many consequences of having disrupted the climate, leads to an unmistakable outcome: we soon will consume far fewer resources. Our everyday behaviors, metaphors, institutions and world views are not prepared for this new reality. Fortunately, behavior patterns of long ago, and our adaptive nature, suggest that we can respond well to this challenge. Papers, published periodically, seek to help people envision a pragmatic response that supports a rapid transition to a psychologically wholesome and durable existence.